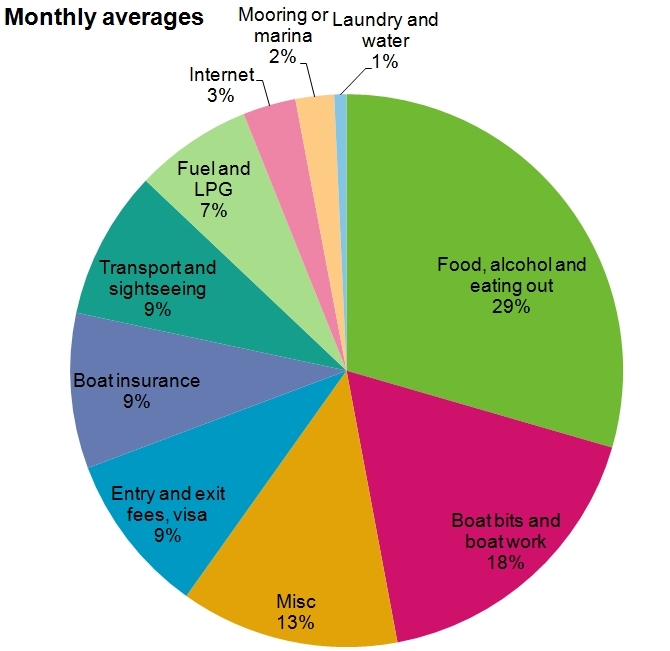 June was our second most expensive month at NZ$ 2926, however, that's because our annual boat insurance was due and without that cost of $1974, June would have been our second cheapest month at only $952. And that even with our most expensive eating out month ever, funny how that item just seems to grow each month almost. I think the tipping point was an expensive lunch we had at the fancy Empire Hotel in Brunei with the Norwegians, but it was good too. 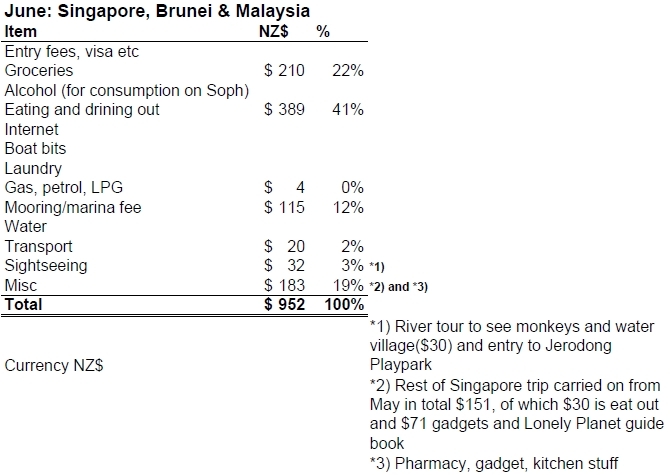 The last few days of our trip to Singapore (most figured in May's budget) came in at $151. Other than that, an interesting fact is that June is the only month without internet expenses! In Singapore we had internet at Theresa's place, in Brunei free wifi is part of the $5 a day for use of the yacht club's facilities. The two days we have just spent in Malaysia before the race we just used our old sim card from Malaysia we have loaded up earlier on. Although admittedly we barely had time for playing on the internet there, we were busy being social and also getting Sophia ready for the race. As this is the 12th month, I have also made an annual overview of all the months put together, fun to see our whole year of cruising layed out like that. Interesting for example that the last four months we haven't had any expenses in regards to clearing in and out of countries. The reason for that is it's free in Malaysia and Brunei and in Philippines there are only entry, not exit fees. If you want explanations to each month and for example what the general misc item consists of (varies each month), you can find them here. 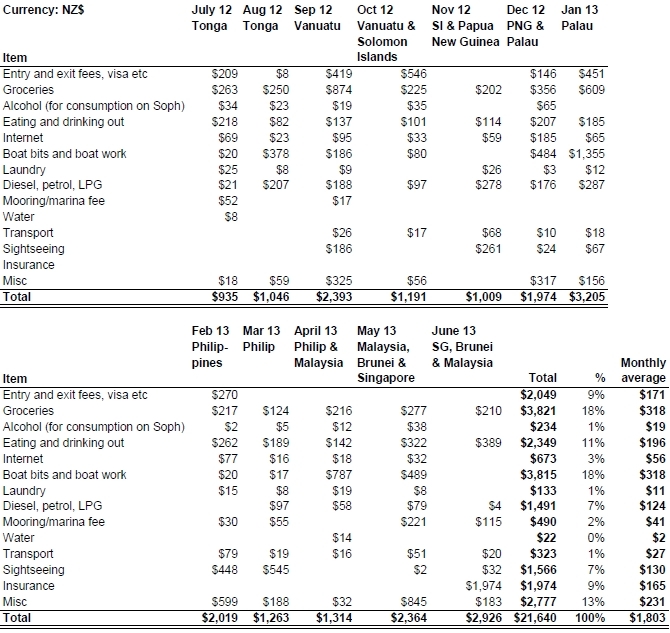 Insurance is a big item, without it the monthly average for our cruising costs would be NZ$1600 and not $1800. And this is even only insurance for Sophia, not our health insurance. My lovely parents insist we have health insurance and they also pay for it. I struggled to even find insurance, both for us and Sophia before we left, but in the end I found boat insurance through the (NZ) Island Cruising Association with Edward William Marine Services, and for health insurance I found several options from the Seven Seas Cruising Association (US). Thankfully we haven't needed to make any claims, so I can't say anything about either services. I have also made a pie chart to show which items are biggest. For that I added some of the items together, eg groceries, alcohol and eating out, otherwise the many different items made it confusing to get a good overview. This cruising budget is of course reflective of us and will vary hugely from boat to boat. This is our first year out, so Sophia was well stocked with food from NZ, the cost of which occured before this year began. Sophia also left NZ with brand new sails and canvas and major work done to her, so this first year will probably also be cheaper than subsequent years when more things break and wear out. Another thing to note is we're pretty light drinkers, so the alcohol item and drinks out is very small compared to most cruisers. Other cruisers also spend much more on sightseeing and here in Asia there are quite a few marinas, and they aren't free. In the Pacific it's easy because there simply aren't any marinas (or only a couple), so it's all just free anchoring. We do also know some cruisers who spend less money than us, typically older people (hardy long time cruisers) with only a set income like pension.